Commonly called Koi in the western world, and originating from the common carp, Cyprinus carpio, the name “Koi” comes from Japanese and simply means “carp”. In reality the name Koi thus includes both the dull grey food fish as well as the brightly colored ornamental varieties. The correct name for the beautiful ornamental carp is Nishikigoi – a name that literally and very descriptively means “brocaded carp”. If you wish to become an afficionado of this fish, it would be wise to learn and use the correct term, as Nishikigoi were developed in Japan and the language of the koi world, or more correctly, the Nishikigoi world, is and will remain Japanese. Japanese is used not only to name the varieties, but also for many of the terms used to describe the colours and traits of these beautiful fish. Nishikigoi (or Koi) varieties are distinguished by coloration, patterning, and scalation. Some of the major colors are white, black, red, yellow, blue, and cream. The most popular category of koi is the Gosanke, which is made up of the Kohaku, Taisho Sanshoku, and Showa Sanshoku varieties. The beauty of Nishikigoi truly deserves the accolade “Living Jewels”. We hope that you discover much more by studying the images and information below, and we wish you joy with your Nishikigoi! Finally, we have this advice for novice koi hobbyists: Do not get daunted by the flurry of Japanese terms corresponding to the various breeds of this fish. Get accustomed to the terms slowly, let the information sink in and enjoy the learning process. 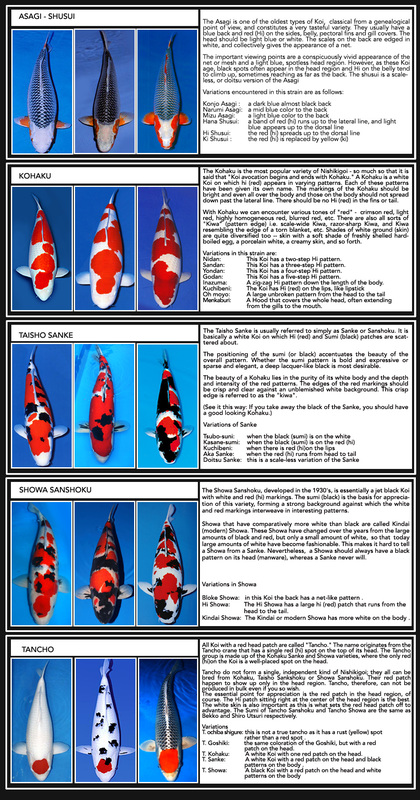 The best starting point of this learning process is more often than not with the three most established and most popular breeds of koi, namely the ‘Kohaku’, the ‘Sanke’, and the ‘Showa’. ’Gosanke’ is the term used to refer to these three breeds taken together. Talk often to other Koi enthusiasts – and if you can, ask breeders to point you in the right direction. They recognise the potential of baby Koi very early on! The more you hear these terms, and the more you watch what other hobbyists do, the sooner those bewildering koi terms will become part of your everyday vocabulary! Copyright © Nembwe. All Rights Reserved.